Compatible with JIVE2 Platinum, JIVE2 and METRO2 prams, and 2015-2017 JIVE and METRO prams. Make family adventures a breeze with our Redsbaby AirFlow Kit. The kit has been designed with warm Australian climates in mind and will provide your child with a cool and comfortable ride. 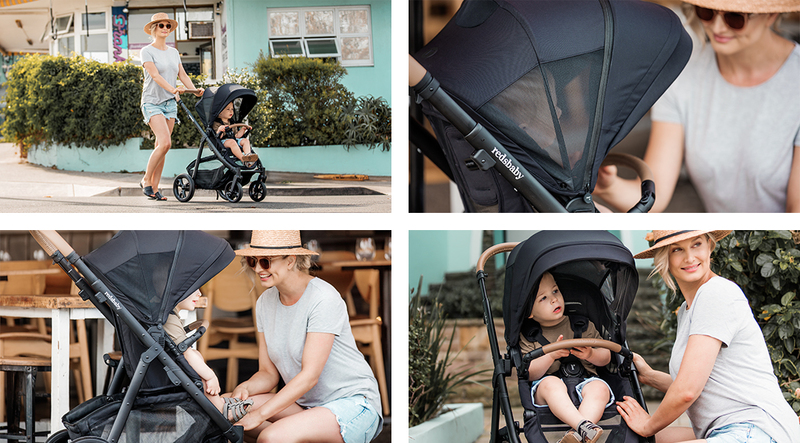 The AirFlow Kit includes a main seat fabric; featuring mesh ventilation panels for ultimate circulation, and an extension canopy with built-in sun shade to protect your little one from the sun. The AirFlow Seat fabric is fitted to your existing Redsbaby pram seat frame, and the AirFlow Extension Canopy is fitted in place of your existing pram canopy. Q: Which Redsbaby prams is the AirFlow Kit compatible with? A: The AirFlow Kit is compatible with JIVE2 Platinum, JIVE2 and METRO2 prams, and 2015-2017 JIVE and METRO prams. Q: How do I use the AirFlow Kit? A: The AirFlow Seat fabric is fitted to your existing Redsbaby pram seat frame, and the AirFlow Extension Canopy is fitted in place of your existing pram canopy. Please refer to the instructions that can be found in the AirFlow Kit for further guidance. Q: Can I purchase the AirFlow Seat or AirFlow Extension Canopy as separate items? A: No. The AirFlow Seat and AirFlow Extension Canopy must be purchased as a kit. Q: How do I wash the AirFlow Seat and AirFlow Extension Canopy? A: Remove the AirFlow Seat fabric and Extension Canopy from your seat frame and hand wash in cold water with a gentle detergent. For more information please refer to the care label located on the AirFlow Seat fabric and/or AirFlow Extension canopy.